Why do VRLA Batteries not last? What is the reason VRLA Batteries fail prematurely? How do I ensure longevity from my Battery System? Questions that are regularly asked – the answer, is there are multiple reasons why your system might not last as long as you think it should! In this blog post, the experts at Valen take a look at some of these reasons and ways you can prevent your VRLA batteries from failing prematurely. 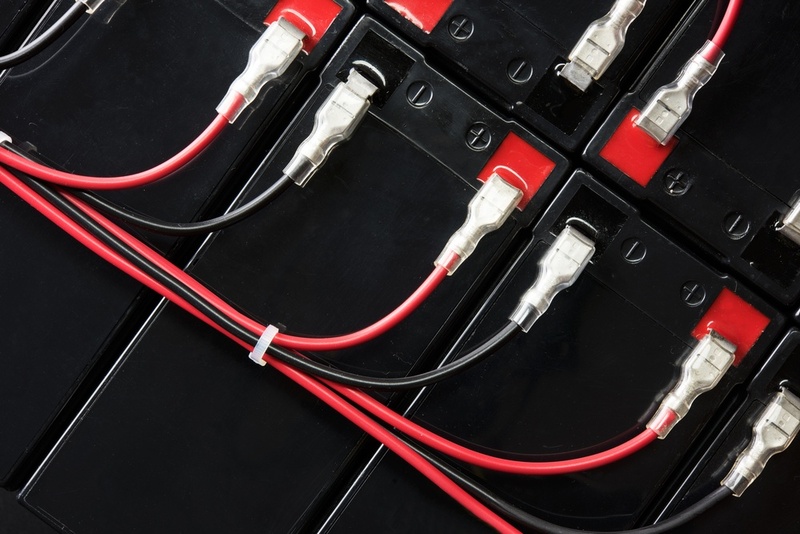 Specifying the correct battery technology based on the application is crucial. Different battery technologies are designed and manufactured for the demands of different applications. 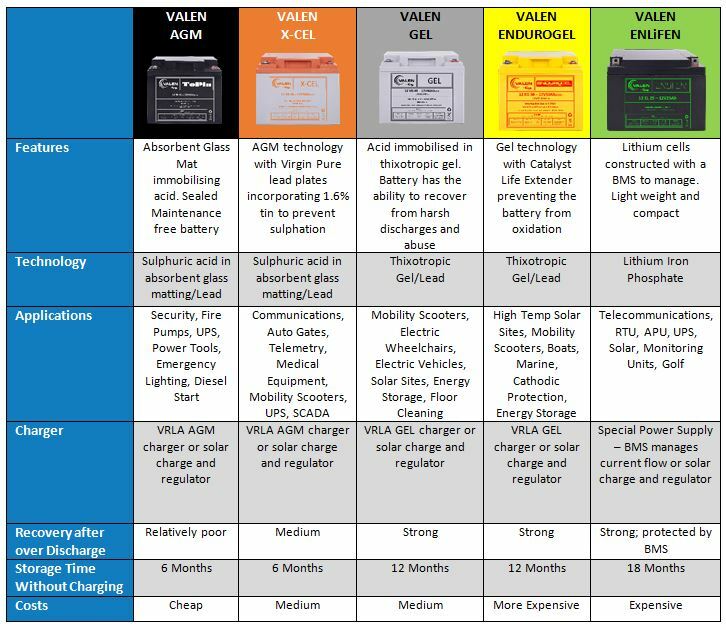 Each battery technology has its own strengths and weaknesses, as shown below based on our range of 12V VRLA Batteries. Temperature plays a dramatic part in the accelerated failure of VRLA Batteries. Every increase by 8°C above 20°C HALVES the life of the battery. That’s a stunning statistic, especially in a hot country like Australia. Catalyst – using a battery with the Catalyst Life Extender, which prevents dry out, allows that 20°C threshold to be raised to 30° Regal Electro’s Valen ENDUROX-CEL and ENDUROGEL feature the revolutionary catalyst. Unequalisation occurs when one or more battery cells falls out of line and become unbalanced. This in time affects the whole battery system as it loses ability to charge and discharge equally. Eventually these failing cells totally drop out and fail, placing extra strain on the complete system, or swell up and get hot due to the extra pressure placed on them. Utilising an equaliser that sits across your battery strings will ensure that each cell is equally charged and discharged. These are available in various 48V and 12V options. Periodic maintenance including monitoring of individual battery cell voltage on maintenance inspections is also recommended to ensure that the system is running well. Prevention is better than cure! The best thing you can do is treat your Battery Banks with the appropriate care. It is always a great idea to use the Installation and Operation Manuals for all batteries; these can be found under the Battery Product Pages under Downloads). These will give you the appropriate details including detailed information on charge rates, storage and installation metrics based specifically on the relevant Battery Technology. Ensure the correct battery is selected for the applications. Batteries are designed with specific functions in mind. For example, the Valen GEL Battery has advanced cyclic abilities making it perfectly suited for applications such as Mobility Scooters and Solar Systems. Placing an AGM in these cyclic situations would mean that the battery will have a substantially shorter life. Regular site visits are imperative to ensuring that the battery system is running well. The Installation and Operation Manual (I&O) will detail the steps you need to complete an on-site visit. These checklists include, Battery Terminal Torque settings, ensuring all connections are correct and tight, Battery Impedance (and Discharge Load testing where available), and more. Maintenance and monitoring on other equipment that affects the battery system is imperative as well. For example, checking that Solar Panels at site are clean, unshaded and functioning at full efficiency. Battery Storage is very important to the life of the battery and needs to be adhered to in accordance with the manufacturer’s Installation and Operation Manual as storage instructions will vary depending on the Battery Technology in question. Need some extra advice on how to prevent battery failure? Just ask us!